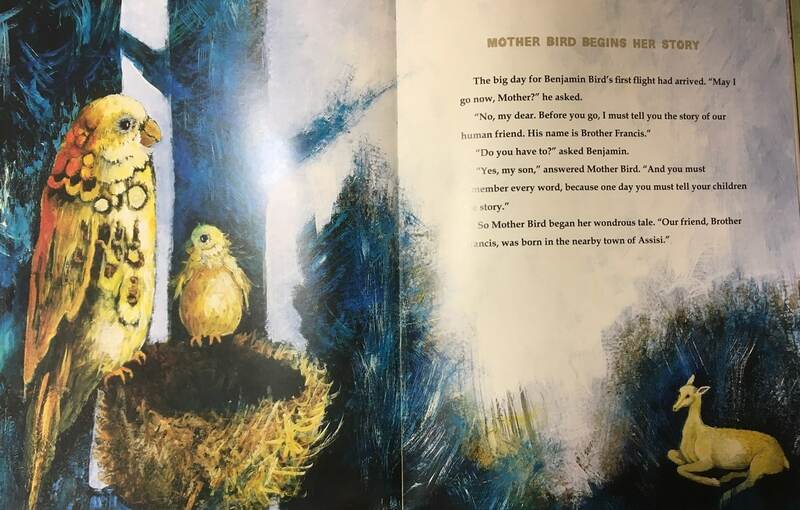 Narrated by Mother Bird, this picture book is an elegantly-illustrated retelling the familiar stories of St. Francis and his interaction with the animals. Today marks the centennial of the birth of author and illustrator Ezra Jack Keats, renowned for his delightful picture books for children. The indie publishing group McSweeney’s, long heralded for their creative writing, has recently launched a children’s book imprint called McMullens. The first book published under the new imprint this summer was the lovely Symphony City by Amy Martin, a noted graphic designer whose work has appeared in newspapers across the country, including the New York Times, and on concert posters for notable bands such as Death Cab for Cutie and Band of Horses. The book tells the story of a girl who gets lost in the city on the way to see the symphony and follows the music on an adventure through the city until she eventually arrives home. However, only a very small portion of the story is told in words, and the bulk of it, appropriately, is told through Martin’s superb illustrations. The book is itself a symphony of line, shape and color, swirling through the streets and the air – a flock of golden birds is prominent motif that swoops through the book. Martin’s depiction of urban life is undoubtedly a touch idealized – a city aflood in color, music and life – but like Peter Brown’s delightful recent picture book The Curious Garden, it is a hopeful book that reminds us of the best of urban culture. A Song of John Coltrane. With three kids ages six and under, I am always on the lookout for excellent new picture books. I was therefore delighted to stumble upon the recent book Before John Was a Jazz Giant: A Song of John Coltrane by Carole Boston Weatherford (and illustrated by Sean Qualls) at my local library. Although from the title, one would suspect that this book was about John Coltrane, which it is, it is not primarily a biography, but rather uses the story of Coltrane’s boyhood as a pretext to teach the spirit of jazz and the practice of listening. Or to put it differently, this is a biography of John Coltrane in sounds. Coltrane’s formation, as presented here, is fundamentally an aural one. Weatherford, using simple and poetic language, makes the case that the sounds that Coltrane heard as a school boy (“hambones knocking in Grandma’s pots,” “Mama playing hymns for the senior choir” or “the sobs of kinfolk at family funerals” for instance) were essential to the classic jazz pieces that he would come to compose. Listening, of course, as Weatherford’s telling Coltrane’s story here emphasizes is vital to the creation of art that is rooted in a people and a place. Qualls’s brightly colored illustrations, done in varying levels of abstraction over the course of the book, are reminiscent of the classic jazz-tinged work of Ezra Jack Keats and vividly capture the jazz imagination of Weatherford’s rendition of the Coltrane story. Weatherford’s writing ultimately climaxes at the heart of the story: “Before John was a Jazz Giant, he was all ears.” Ending on this resonant note challenges us to consider what we might create out of our own experiences among a people and a place if we too would only be “all ears”? For the last couple of years, I have been starting to explore what an urban naturalism might look like here in Indianapolis. Unbeknownst to me, in New York City, Peter Brown was at the same time fleshing out a similar vision in the form of a picture book, The Curious Garden. This little volume, published earlier this year and filled with Brown’s own rich color illustrations, traces the story of a young boy, Liam, whose home city begins as a dull, dreary place, “without gardens or trees or greenery of any kind.” In contrast to most of this city’s children who spent their days cooped up inside, Liam loved to be outdoors, splashing through the rain and exploring the urban terrain. One day, in the midst of his explorations, Liam stumbles upon an old elevated railway bed that is no longer in use (which, as Brown notes in his afterword, is loosely based on NYC’s High Line). Liam finds that up on this railway bed, there is the very tiniest in-breaking of color, in the form of a few wildflowers and other plants. He feels compelled to begin nurturing these few plants, and as he cares for them – a trial and error process – they begin to spread along the railway, thus beginning a process that will ultimately transform the city out of its dreary darkness into a vibrant green and multi-colored locale. Brown has taken a minimalist approach to the text here and much of Liam’s story is told simply and creatively through the illustrations. In reading and re-reading The Curious Garden, I was struck by Brown’s idea that the transformation of the city is already at work in nature and that our job as humans is to seek out these burstings forth and to nurture them as they expand. This fruitful combination of attentiveness and diligent care provides a solid foundation, I believe, for the practice of an urban naturalism. The Curious Garden is, by far, the best book for children (of all ages) that I have found this year, and with time it will undoubtedly reign – with Dr. Seuss’s The Lorax, Robert McCloskey’s Make Way For Ducklings and a handful of other books – as one of the finest ecological picture books of all time.